i2 Analyst’s Notebook allows users to quickly collate both structured and unstructured information in a powerful visual analysis environment. It supports analysts in rapidly building a single, cohesive intelligence picture. The intuitive, modern user experience reduces user familiarization times, allowing users and organizations to quickly take advantage of productivity gains. The flexible data model and visualization environment that is coupled with a comprehensive range of visual analysis tools help users build insight and understanding on complex data sets. It helps drive the faster discovery of key individuals, connections, relationships, events, patterns, and trends in data that might otherwise be missed. Integrated Social Network Analysis capabilities also deliver increased comprehension of social relationships and structures within networks of interest. 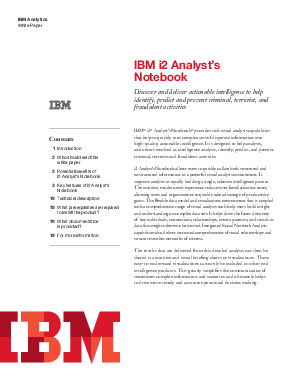 Download this ebooklet to find out more on how IBM® i2® Analyst’s Notebook® provides rich visual analysis capabilities that help to quickly turn complex sets of disparate information into high-quality, actionable intelligence.